In my last post, I talked about the importance of the Maillard reaction. By controlling temperature and getting it in that 300F-400F environment, you can get a nice color and flavor. It's easier for baked and deep fried items, but what about the stove? Most people sear their steaks on the stove before they Sous-vide. I actually cook my steaks using only a stove. I like to stir fry veggies on the stove and over the years I found the majority of the cooking I do is on the stove. How can we know the temperature of the frying pan? 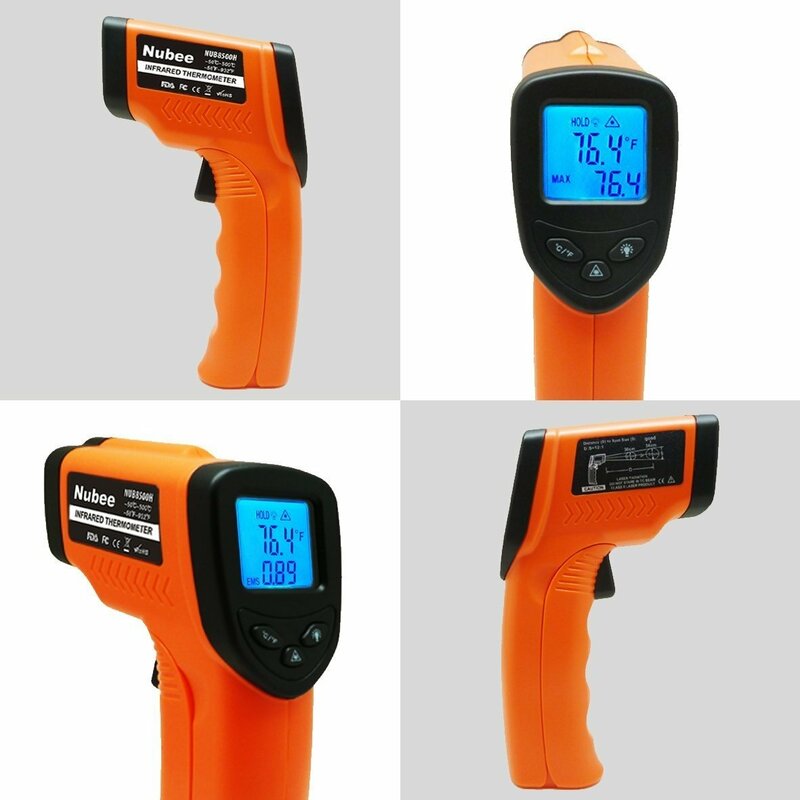 https://www.amazon.com/Etekcity-Lasergrip-774-Non-contact-Thermometer/dp/B00837ZGRY on sale for $11 w/coupon code. It is currently at $16 and is still a great price. My 3 year old daughter broke mine this morning and I will definitely order another, maybe an extra to keep in my car for times I need to cook at HB. I like that model and it worked well for me for a couple years. 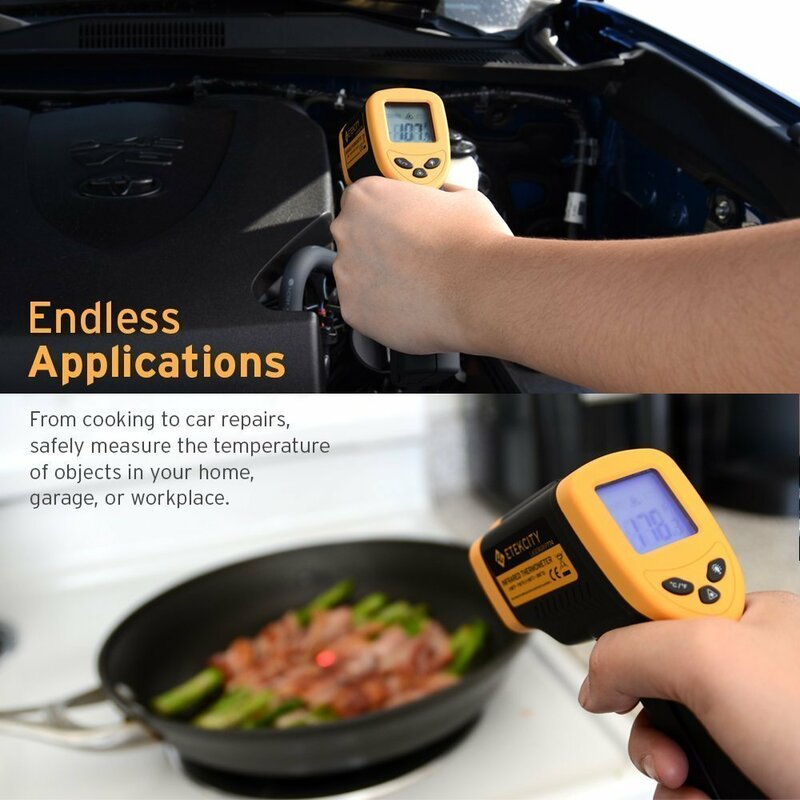 When I looked it up on Amazon this morning, I saw another one with good reviews for $5.34 https://www.amazon.com/gp/product/B00JCFPODM/ At that price, I might just give them away whenever I go to someone's house to cook. It's pretty fun to use inside and outside the kitchen. On a hot day I go into the kids' room and aim it at the ceiling. "Hmm. 87 degrees. yeah it's pretty warm in here." In the kitchen I set my stove to a 7 and wait a while. The pan heats up to 350F to 400F before it starts slowing down to eventually 500F. I made pancakes this morning and it was 375 before I made the next batch. After I took it off, the pan was around 310F and ready for the next batch within a minute. Through trial and error I decided that a 7 on my stove would get me the best temperature range as I cook. When I got to 8, it starts to burn the food a little. When I go to my parent's house, their stove is completely different and I find that I need to go to a 9 to get the same results. At HB, I am turning the stove to 2/3s of the way to get the range I like. This cheap tool lets me get the nice Maillard reaction (from the last post) when I cook something on the stove. It should not be used to see if someone has a fever. You are measuring surface temperature and not internal temperature. Your skin is around 80F not 98F. An error range of 2-3F matters for the human body. It may say 100F when aimed at your tonsils when it is actually 98F. I don't really care much if the frying pan is read as 350F when it is really 345F. It is a tool not meant for something as sensitive as the human body. I like to use this when I grill as well. I like to get the grates at double desired temperature so 600F-700F. When the meat goes on, it sizzles and slightly chars but then the whole thing cools down as the meat robs all the heat from the grates. It makes nice sear marks when I do this. It can be used to calibrate ovens (especially old ones). Let it preheat and then aim it at a wall. When I set mine to 350F, it really is 350F give or take a few degrees. Some ovens are set to 350, but are actually 300F and it never comes out right when you bake. There are oven thermometers for this as well.